Combine dry ingredients: coconut flour, baking soda and salt. In a separate bowl whisk together wet ingredients: honey, maple syrup, almond milk, eggs, melted coconut oil and vanilla. Fold in your berry mix. 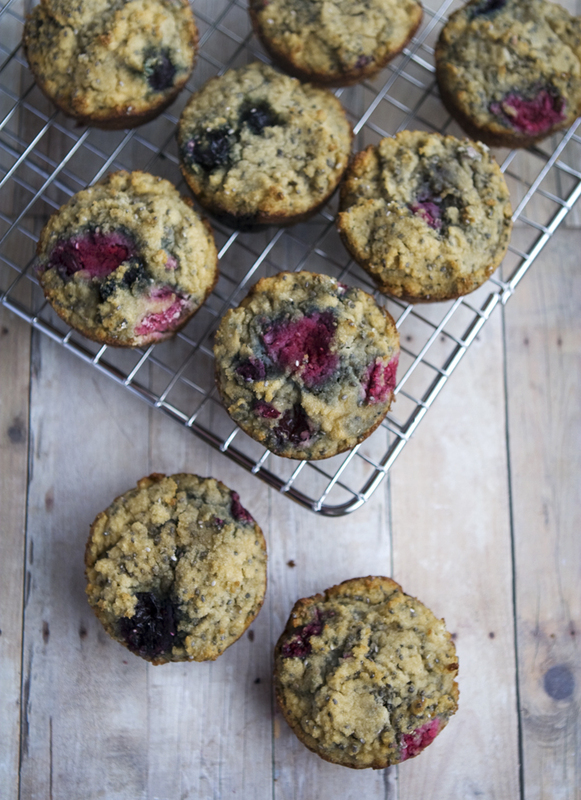 Bake 25 minutes or until muffins are golden brown and toothpick comes out clean when inserted into the muffin. Remove from oven. Let cool, then transfer to a wire rack to cool. 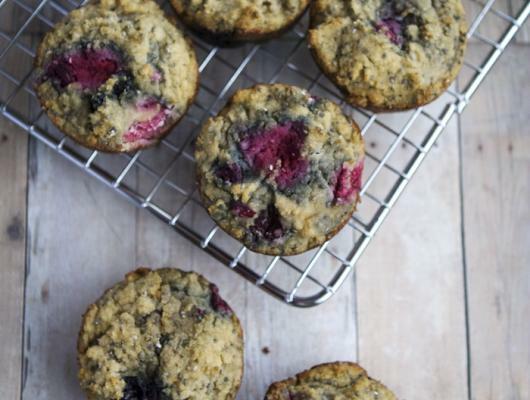 This muffin recipe is packed with awesomeness: coconut flour (high in fiber and protein), coconut oil (full of amazing fatty acids), chia seeds (packed with Omega 3’s and antioxidants) and mixed berries (high in antioxidants phytonutrients and deliciousness)! Quick note: baking with coconut flour can be a unique experience. It absorbs moisture like a sponge, and requires an equal ratio of liquid to flour. When you’re combining your wet and dry ingredients, and the consistency seems a little soupy, give it a minute. The coconut flour will start to absorb the liquid. If it seems too stiff, stir in more almond milk, (a tablespoon at a time) until it gets to a pleasant consistency.